The month of Chaitra, which starts in April, is considered holy by Indians all over the world, and each community celebrates it in some way or the other. For most Hindu communities, it marks the beginning of the lunar year. It is celebrated as Ugadi, Vishu, Varusha Pirappu, Baisakhi, Gudi Padwa, etc. Gudi Padwa, or Chaithra Shukla Pratipada, is a Maharashtrian festival that is celebrated on the first day of the Chaitra month of the Hindu calendar. Being the first day of a new lunar year, it is traditionally celebrated as Hindu New Year. It is believed that the universe was created by Lord Brahma on this day. Chaitra Navratri is also known as ‘Vasanta Navratri’ or ‘Rama Navratri’ as the ninth day of the Navratri festivity is celebrated as the birthday of Lord Rama. People belonging to the Kutchi Gujarati community also celebrate this auspicious day as new year. How do Maharashtrians celebrate Gudi Padwa? Gudi Padwa is a day that combines worship with celebration. Right from when the family wakes up, each member is busy with some joyful task or the other. The day is packed with interesting activities like decorating the house with colourful rangolis, making of bamboo dolls, conducting pujas, cooking and tasting food with a mix of flavours, and many more such activities. • All the family members get up early in the morning, clean their homes and take a good clean bath (abhyangasnan bath). Now comes the fun part – they wear new clothes! • The front yard and/or the area outside the main door are decorated with colour rangolis or flower rangolis. A string of mango leaves and flowers, known as Toran, is fixed on the main door. • The idols kept in the pooja ghar are given a holy bath with chandan or fragrant utana. This is followed by puja and arati. As part of the puja, lamps and incense sticks or cones are lit as signs of auspiciousness. Neeranjan is offered and the family prays together to the deity for everyone’s well-being. • Kids worship their school books, as Saraswati Devi, the Goddess of Knowledge manifests in the form of books and other tools of learning. • Another interesting custom is to make Gudi or dolls out of bamboo sticks. A copper, brass or silver pot (new or properly cleaned one) is used to make the face of the gudi. The doll is decked with new silk cloth, neem and mango leaves and coloured garlands. Sweet batasha garland is offered and tied on the doll. This beautiful gudi is then placed or hoisted outside the main door or a window near the main home entrance. Diyas or incense sticks are lighted in front of the gudi and worshipped. • It is believed that on this day Lord Ram returned to Ayodhya and people welcomed him by hoisting pretty gudis in front of their houses. So, the custom continues. • Everybody touches the feet of their elders and gurus and seeks their blessings. Friends and relatives wish each other a Happy New Year. • This day is one amongst the 3½ muhurats considered to be extremely auspicious for starting new things or doing good deeds or charity. You can start doing new things (example, start music classes), inaugurate a business or shop, construct a new house, purchase gold ornaments or new vehicles, etc., on this day. • Food being part and parcel of all festivities, it plays an important role here too. The family sits together and enjoys a traditional meal along with one or more Indian sweets. Shrikhand, or sweetened and flavoured hung curds, is a must for this occasion. It can be made at home or bought, because a lot of variety is available in stores these days. • It is also customary that every family member consumes at least a little bit of neem juice on this day. The philosophical reason is that all sweetness in life is punctuated by a little bitterness – there are ups and downs in life and we should face it with fortitude. Every bad experience also ultimately leads to some learning and makes us a better person, just like the bitter taste of neem juice leaves a sweet aftertaste on your palate! • Neem juice also helps improve your resistance and helps fight infections that inevitably come when the weather changes. It starts getting warmer after Gudi Padwa and having some neem juice will stand you in good stead! Your Gudi Padwa feast can comprise one or more of the following dishes, along with the traditional main course dishes you normally have for any traditional meal. Shrikhand is a must for this festival, and it can be made at home or bought from the market. You can have a fruity Shrikhand like Mango Shrikhand or a spice-soaked one like the Kesar Elaichi Shrikhand. Diabetics can also have something healthier like the Mixed Fruit Shrikhand, so that they do not feel left out! Puri is just the right combo for Shrikhand, so go for plain puris or something more flavourful like the Masala Puri or Phudina Puri. 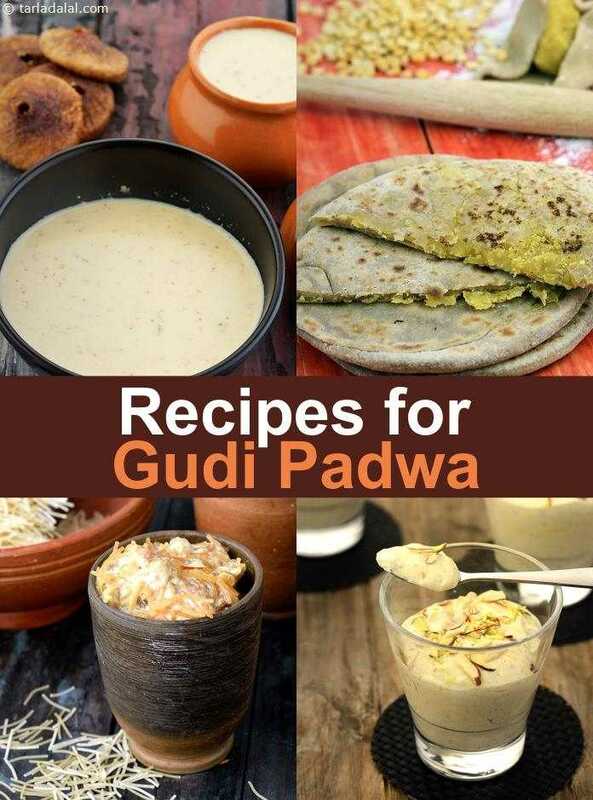 Maharashtrians love Puran Poli, and so it is apt to make it for Gudi Padwa too! But, you can also add more sweets to the spread like Gulab Jamun and Basundi, or something richer like the Anjeer Basundi. Rice Kheer or Seviyaan Kheer is always a welcome addition, and so is a Bengali sweet like Rasmalai. A heavy meal like this is sure to put you in a satisfied trance for a while, so after a short afternoon nap and a cup of chaai, you will be ready to exchange greetings with neighbours, and host or visit friends and relatives in the evening. You can even invite some of your close relatives or friends in the evening to celebrate and have dinner together. Tarla Dalal Hi, Thanks for your feedback.